When looking at your application, we want to know you. We don’t just focus on your GPA or test scores. Our staff engages in a holistic review process, meaning we review everything that is submitted as part of your application so that we get a well-rounded view of you and your accomplishments. 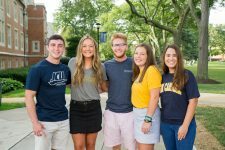 We want to be confident that JCU is a place where you can succeed academically and contribute to our campus. In addition to your high school record and ACT/SAT test scores, we carefully consider your extra curricular involvement, your essay, and your letter(s) of recommendation. We also want to attract students of diverse economic, racial, and religious backgrounds to John Carroll, to maintain wide geographic representation in each class, and to actively seek significant talents of all kinds. In order to enroll at John Carroll University, you must have a high school diploma or its recognized equivalent. Upon enrollment, a final high school transcript is required in order to confirm your graduation from high school. Have a unique situation or circumstance? Please be sure to tell us about it either in person with a staff member or in writing as a part of your application.